Alma Paprika-(Capsicum annuum)- Alma Paprika is a delicious variety that is sweet yet spicy. The plants produce peppers that average 2-4 inches long. The Alma Paprika peppers are slightly flattened on the top. They resemble a Pimiento in shape but start out white and then slowly turn orange and finally turn red at maturity. The fruits are round and very thick walled making them great for stuffing if you like your peppers spicy. They are very sweet yet have a mild spicy flavor which is lower heat than a Jalapeno but still warm enough to be tasted. The Alma Paprika pepper is great for drying and grinding into a sweeter Paprika powder or for using fresh in cooking, eating fresh on salads, or for grilling! 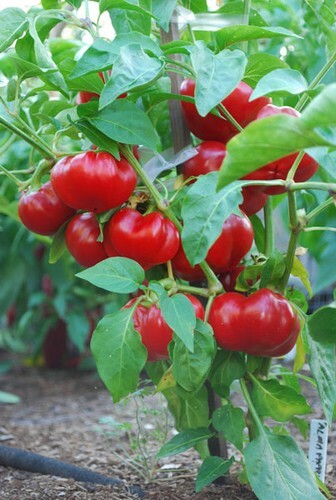 The Alma Paprika chile plants can grow to three feet tall and are very productive.